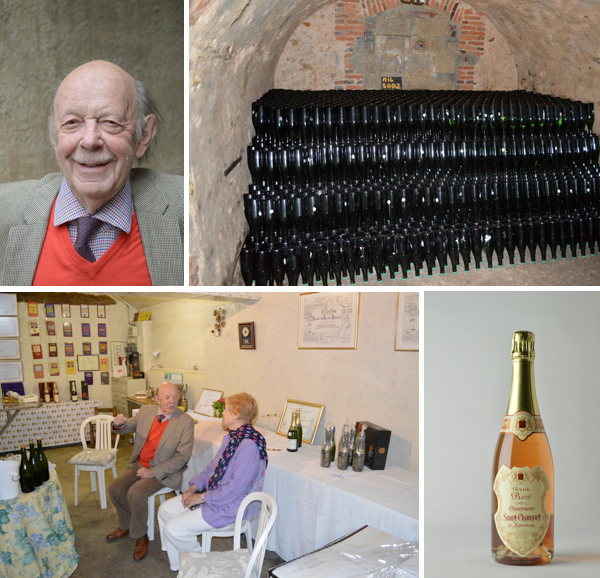 Champagne Saint Chamant was established in 1930 by Pierre and Hélène Coquillette. Their son, Christian, took over the estate in 1950. Located in Épernay, the house’s unsigned, unassuming exterior in no way hints at its labyrinthine cellar, built in the early 19th century, which is a mile long — and lined with hundreds of thousands of carefully aging Champagne bottles.Charmingly mustached and quite dapper, octogenarian Christian specializes primarily in Blanc de Blancs with more than 28 acres of Chardonnay vineyards in Grand Cru Chouilly. The house also makes a small amount of rosé, from 92% Chardonnay and 8% Pinot Meunier from Épernay. Christian is a firm believer in extended lees aging, and he disgorges only once the wines have been ordered. All Saint Chamant Champagnes are of a distinctive style and sophisticated quality, reflecting well the elegance and refinement of their maker. They display a heady, old-time richness and vinosity with extremely fine bubbles. Martine’s Wines is the appointed importer for Saint-Chamant in all of the United States with the following exceptions: GA.